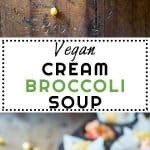 The creamiest nut-free and low fat Vegan Cream Broccoli Soup the world has seen and tasted. 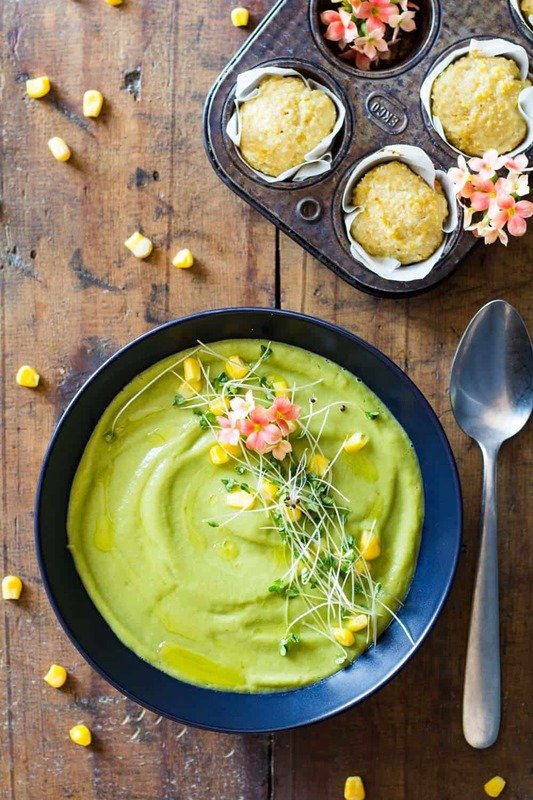 Roasted Garlic for taste, cooked broccoli for color and nutrition, vegetable broth for warmth and corn kernels for fun. So, “creamy” soups always contain a ton of, well, dairy cream. Right? Or if vegan, they tend to contain a ton of cashew cream. Both equally high in fat. And that can be quite heavy, especially when all we want is an appetizer soup. For now let’s enjoy a low-fat version and vegan cream broccoli soup that makes dairy cream and cashew cream obsolete. The hero as in most my soups so far: Roasted Garlic! I can’t get enough of this stuff. Roasted Garlic Butternut Squash Soup, Roasted Garlic Potato Leek Soup, Roasted Garlic Tomato Sauce. Do you see some sort of pattern there? 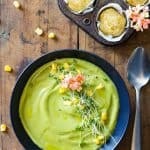 Vegan Cream Broccoli Soup without cashews?!? Yes, this is possible! You don’t HAVE to add cashews to the soup to make it creamy. You can of course but I find that adding cashews is 1. expensive, 2. very rich, 3. everything tastes like cashews. Don’t get me wrong. I LOVE cashews. I love their nutritional value and I love, love, love their taste. However, adding them to soup is not my favorite. 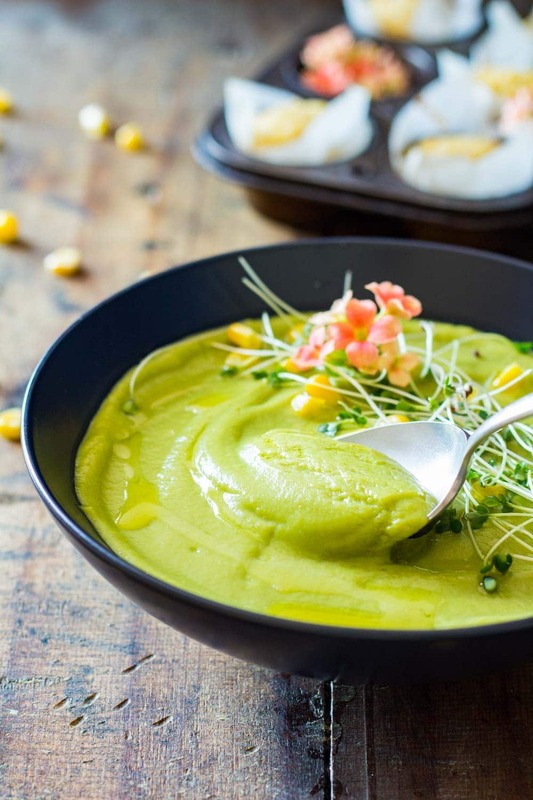 They are much healthier eaten raw and broccoli soup should taste like broccoli. Right? So how does one achieve a creamy soup without adding ANY thickener? You just have to cook the vegetable well until it’s really soft. Add only little liquid. Use a high power blender and blend blend blend. Cut the top part of the garlic in order to expose the upper part of every clove and drizzle a few drops of olive oil onto each clove. Place garlic bulb in cocotte or other small ovenproof dish and cover (with lid or aluminum foil). Roast for approximately 40 minutes or until soft like warm butter. Now, wash broccoli and peel the stem with a vegetable peeler. Cut the stem into about 1/2" (1 cm) rounds and set aside. Cut the rest in florets and set aside. Heat a 2 cups of vegetable broth over medium heat. Salt if necessary. Once hot, add broccoli stem round and reduce heat to medium-low. Cover and let simmer for approximately 5 minutes. Then add the florets and cover again and let simmer for another 10-ish minutes or until florets and stem are very soft. Use a fork to verify. Make sure to always keep the pot covered or else all the broth will evaporate. Add soft cooked broccoli and broth plus roasted garlic cloves to a blender and blend on high for quite a while until very very smooth and silky. You might have to add 1/4-1/2 cup of water depending on how much power your blender has. Taste for saltiness and adjust. Add corn kernels to soup and serve. 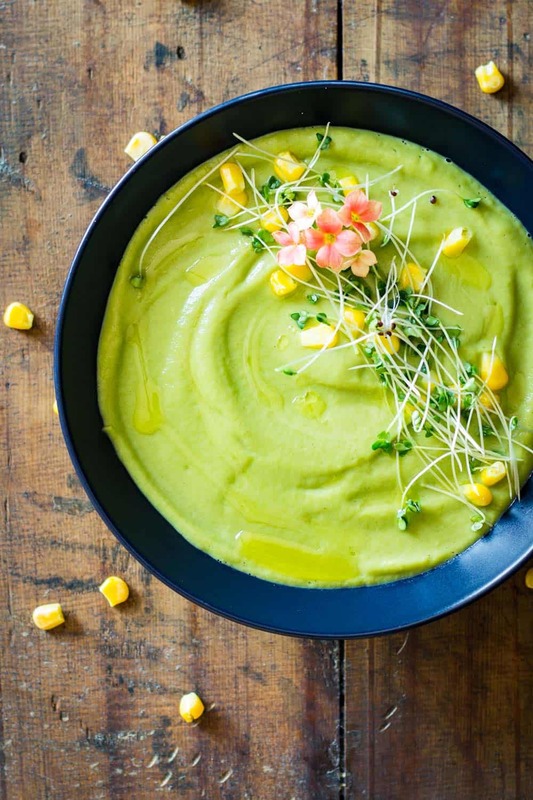 Decorate with broccoli sprouts and extra corn kernels. I am a Hugh soup fan. Can’t wait to see some of your other soups. Love this! I, too, get sick of the all pervading cashew flavour when cooking vegan. You’re good!